Environmental journalist writing about water, energy, tech and politics. Many of Sandeep Giri's coworkers still feel the ground beneath them shaking. They are scared to step inside their homes. And those are the lucky ones that still have homes. Giri, who was born and raised in Nepal, is the CEO of Gham Power, a solar company that's been operating in Nepal for the last five years. Following the 7.8 earthquake on April 25, Gham Power's employees sprung to action to deploy solar power systems in the wake of the disaster to help power lights and mobile charging stations for relief workers and the displaced. But they want to do more. "From a practical level, once your most basic needs like medical attention, food, water, shelter are addressed, or even while they are getting addressed, two issues stand out as a major problem," says Giri. "First, you don't want to be in the dark, as it's scary, you don't feel safe, and it is also very cumbersome to get, or administer relief without light. "Second, in this day and age, your first instinct is to reach out for your loved ones to check if they are okay and let them know you are okay, and when you reach for your mobile phone, it's dead and there is no place to charge it." Gham Power has teamed up with other local solar companies and is working with the Global Nepali Professional Network to raise money to distribute as many solar power systems and microgrids as possible. They've launched a new campaign called Rebuild with Sun. Their crowd-sourced Indiegogo campaign has an initial fundraising goal is $150,000 and a breakdown of how far a donation can go. 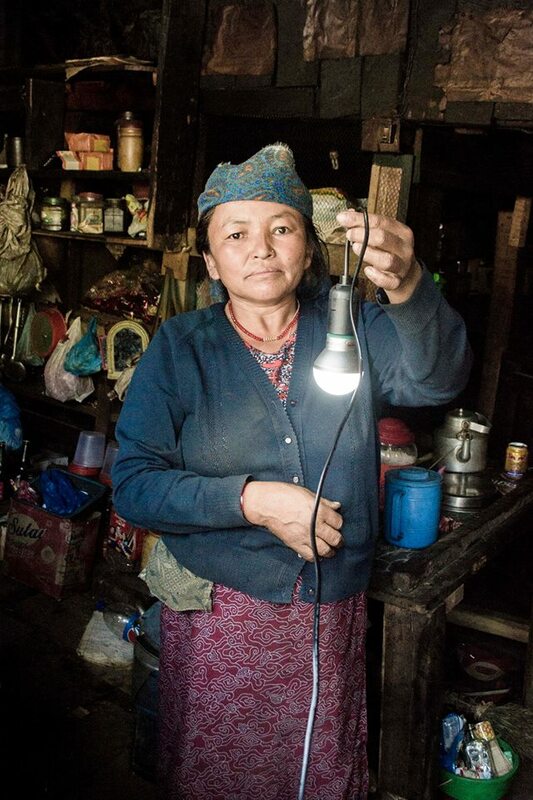 A contribution of $50 provides lights and charging for one family. A hundred dollars buys a 20-watt system that can serve three families and $500 can provide a 100-watt system, aiding 15 families and up to 100 phone users. Rebuild with Sun has a live map of power requests and where they've completed projects, but the need is great. Nearly a half a million people are displaced and many millions more are severely affected. Giri estimates that as many as 650,000 mobile solar power kits are needed immediately to provide basic lighting and charging services, which comes with a price tag of $18 million. And that doesn't include what's needed for relief workers to run heavy equipment, medical equipment, water pumps and other tools -- that could be another $5 million. "So, we are barely scratching the surface with our work at the moment, and we are already running out of supplies," he says. "That's why we need some immediate help, and why we launched our initial campaign." But even in the first few weeks, they've seen the impact of their efforts. "We have seen rural clinics operated from outside their building because it was too dark inside to provide basic health services like cleaning up a wound, applying medicine," says Giri. "Having lights makes such a big impact. While on the surface it doesn't sound like a whole lot -- it is amazing how much impact is made by having lights and some basic power charging capabilities." Much of the world's current disaster relief infrastructure still relies on gasoline and diesel generators. "The fossil fuel alternatives are expensive, and in tight displaced communities, kerosene and candles can be a real fire danger," says Alyssa Newman who manages public affairs at Trina Solar and is part of the Rebuild with Sun team. Diesel generators can also be dangerous if used improperly, and are loud, have fumes and require a steady supply of fuel to keep running, which is another hurdle in post-disaster areas. Solar systems provide an alternative or a complement to traditional power sources, but it's just one component of a much larger relief effort. "I think the medical and general humanitarian response is essential," says Newman, who has also aided in other disaster responses, including in Haiti. "I hope that people will see that we're trying to take care of the caretakers, and help with infrastructure that can help relief workers and Nepalis in this crisis and beyond. 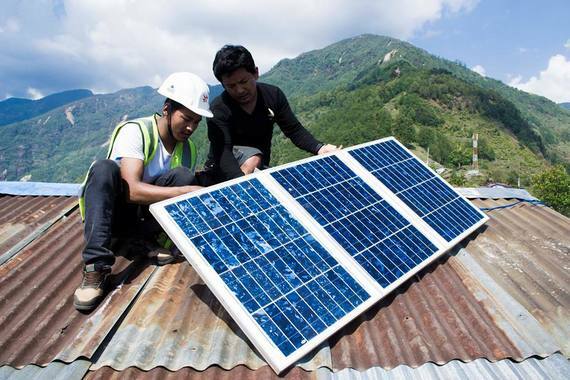 We also want to be a voice for clean energy in Nepal, and plan on connecting our immediate response to a longer term solar rebuilding effort." Prior to the quake, Nepal did not have a stable grid. Nearly a quarter of people lived without access to electricity and many more endured up to 16 hours a day of blackouts because there is simply not enough power to go around -- even businesses with diesel generators for backup still face fuel shortages and high costs. "We have always believed, especially in a mountainous country like Nepal, that implementing distributed energy systems like microgrids is the most robust way of building a sound and resilient energy infrastructure," says Giri. "It's good for the local infrastructure, and good for the planet." This is something Gham Power is already familiar with. The company has been working in Nepal since 2010 and have completed more than 600 projects of varying sizes -- including for a hospital, an Everest research station and the U.S Embassy. 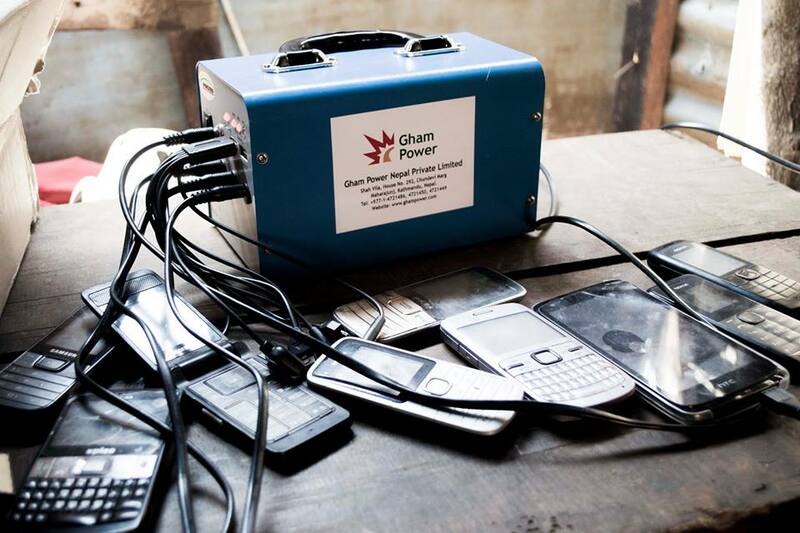 The company has also been establishing microgrids for rural areas to help power small villages. "We feel quite confident in our capacity to execute quickly and efficiently," says Giri. "That's why we chose to focus on solar, something we know very well, and we also chose to focus on lights and charging kits and power stations first, since these will be the fastest to deploy using local resources." With enough support and coalition building, they hope to continue to show that solar is important for Nepal now and in the future. "Climate change looms large for those of us working on energy and environmental issues, and sometimes we need to all connect and work together to show how solar is a viable solution before and after disasters," says Newman.